Does anyone have a perpetual to do list that never seems to get done? It includes items that have no imminent deadline that you can sometimes put off indefinitely. Well I do. What a burden this is hanging over your head, and my procrastination endlessly leads to rushing to get it done at the last minute when if there finally becomes a deadline. If no deadline presents itself it makes its way to my growing “to do” whenever folder to take up space. This made me think of a conversation my 3 year old and I have often. It normally starts, “Mom does tomorrow ever come?” In return I answer, “Tomorrow comes but when it comes it is today and tomorrow becomes the next day.” Believe it or not she has made a little sense of it. If there is something she may not feel like doing at that moment she states, “I will do it tomorrow.” We learn procrastination so easily; I will admit she has a good teacher. 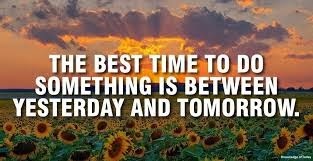 Well my main goal this week, is to make that “tomorrow” to do list be for TODAY!!! This week I am crossing those things off the list. My parents stopped for a visit and due to my Mom’s persistence to get all the laundry, I should have a head start on time because that time consuming task is done(or at least a few days ahead). I am approaching this goal with energy the burden needs to be lifted. I need to move forward each day carrying the weight of one day on my shoulders instead of continually carrying two. New Goals, comments, and excuses are in purple below. 1. Personal Focus to better my relationship with God. Start and end each day with prayer. Read two chapters in the Bible. ·Catholic Video Series 2 Salvation History, I have dropped out of my Bible Study more to come on this later this week. 2. Remove distractions at key times. · Continue to value and eliminate extras in my life that take away from my family. 3. Add something to give more of me to my family. · Share pieces of what I learn about faith in my study with my family. 1. Daily Check Points: GET IT DONE!!! 2. Weekly: Cross off every item on my tomorrow list. Take out Halloween stuff. Climbing the Hill Once Again!